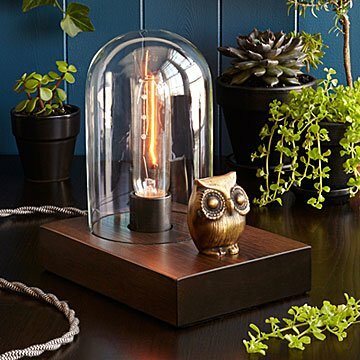 Shed some light on the subject with this vintage-inspired lamp featuring a watchful brass owl. Shed some light on the subject with this vintage-inspired lamp featuring a watchful brass owl. More than just an endearing ornament, Mr. owl acts as the switch for the fixture; simply touch any part of it to toggle through three levels of brightness or turn the light off. The handcrafted wood base, porcelain socket, reproduction cloth-covered cord, and Edison filament bulb under a glass dome all contribute to the abundant vintage appeal of the piece. Bulb included. Made in Los Angeles, California. Luke Hobbs knows why he creates: "It's a great feeling when someone has a particular connection with a piece," says the Los Angeles-based artist. With his work, that happens often. Luke imbues his designs—unique combinations of anthropomorphism and modernity—with a sense of familiarity. "I love sourcing out antique, vintage, or industrial items to incorporate in my work," he says. As a lighting and furniture designer who comes from a long line of skilled midwestern craftspeople, he strives for ingenuity as much as quality. "I am constantly inspired by my surroundings," he says. “I really notice and gain inspiration from details, structure, texture, and layers. I love architecture and urban living, but also have a love for nature." International usage is not recommended if the voltage is different than the US (voltage converter may be applicable). As with any electronics, please protect this piece from damage due to possible power surges. 150 max wattage. Bought this as a desk lamp for my boyfriend's new place. Light is bright and the craftsmanship of the lamp is absolutely beautiful-exactly as expected! Good size and well made. This product was perfect. It was exactly what we wanted. Although very artistic lamps, I've found that I can easily dress-up a room or give it a new "feel" by changing them out and experimenting with different shaped/size bulbs. I have two now. Friends of mine have bought these Luke Hobbs pieces. I will be purchasing one for my brother who has just moved across the country. Nice and creative, however looking at the materials used, it is obviously overpriced. "Whooo" wouldn't like this adorable owl lamp?!! I am currently using this lamp in my living room on the end table and its enough light for reading or simply illuminating the room softly while watching tv. I love my light.it is so pretty. Good quality product. I like the different light settings. I also love owls...the small owl is so cute. I Would recommend to anyone to buy. The only thing that worries me is I am clumsy...I would love the option to buy a replacement dome...just in case. I love this lamp. I read in bed and this lamp is perfect for reading. I love how I can change the brightness with just a touch on the owl. I no longer have to get out of bed to turn my light off after reading. I just touch the owl to turn off. Very well made and beautiful craftsmanship. Would be nice if it came in a couple of sizes as I would not mind it a little larger. But I am very happy with this product enough so that I am going to get one for a friend. This is very unique and fun light. Love it!!! Is going to look great in our cabin. I love this as a night stand light. Can have high when first going to bed, then lower to read as husband sleeps. Wish that the precious little owl was maybe an inch taller.